The 8th annual Union Scholarship Celebration transformed the A. Ray Olpin University Union into a scene straight out of a storybook. Emanating the look of Alice in Wonderland, this year’s theme was “Celebrating the Wonder of Community.” The A. Ray Olpin University Union boasted a record-setting 450 guests who joined us in recognizing admirable student scholarship recipients and acknowledging our extremely supportive donors, both new and continuing. A delectable menu was provided by University Dining Services, sponsors enjoyed a VIP reception in the scenic Crimson View on the Union’s fourth floor, and hundreds of guests took home a basket or item from the silent auction! Beginning with two scholarships in 2011, the Union Scholarship Fund has grown sizably in just eight years and a quasi-endowment of $100,000 has been established. These remarkable achievements would not be possible without the assistance and encouragement of the University of Utah community. 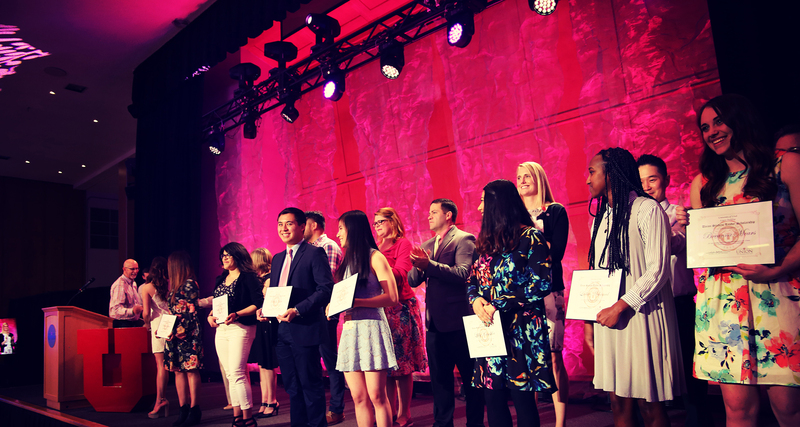 This year we were able to award $100,000 across 20+ scholarships. Many of these scholarships were the result of partnerships with other University of Utah departments. Through collaborations with the American Indian Resource Center, the Dream Center, the Veteran Support Center, West High School, the West High School Alumni Association, the Student Affairs Diversity Council, and Dining Services, the Union was able to offer financial support to students from a wide array of backgrounds and experiences. Thank you to all the groups, individuals, and students who have made the growth of the Union Scholarship Celebration and the Union Scholarship Fund possible. We look forward to seeing you again next year on April 4, 2019, when we gather to celebrate this wondrous community once again! This scholarship seeks to identify and recognize student leaders whose involvement has, or will build campus community and contribute to the overall mission of the Union. The Maria Isabel Reyes Memorial Scholarship provides a scholarship to assist a first-generation student whose commitment to creating an inclusive campus community has, or will, contribute to the overall mission of the Union. This scholarship seeks to assist a refugee student whose community engagement and service have, or will contribute to the overall mission of the Union. The Dream Center at the University of Utah Office of Engagement, in partnership with the Union, has provided this scholarship to assist Dreamers (undocumented students with or without DACA) whose community engagement and service have, or will contribute to the overall mission of the Dream Center. The American Indian Resource Center, in partnership with the Union, has provided this scholarship to assist an American Indian student whose commitment to creating an inclusive campus community, has or will contribute to the overall mission of the Union. The Student Affairs Diversity Council, in partnership with the Union, has provided this scholarship to assist a student whose is committed to creating an inclusive campus community. The Veterans Support Center, in partnership with the Union, has provided this scholarship to assist student veterans whose involvement has or will contribute to the overall mission of the Veterans Support Center & the Union. 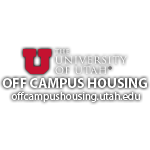 The University of Utah Dining Services, in partnership with the Union, has provided this scholarship to assist a Dining Services student employee whose involvement has or will contribute to the overall mission of Dining Services & the Union.